Fun day in Manly — after just one half hour appointment we had the whole day free otherwise. Will went on a group excursion, Alex stayed with me and we went to Max Brenners for a drink. We all saw The Croods in the evening–really very good! I knew so little about it, but it’s part family adventure part animated “Clan of the cave bear”. Some beautiful scenes and great action. 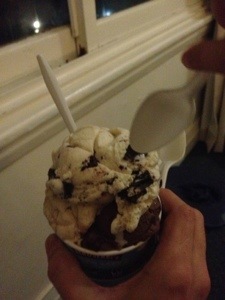 Mmmm… Ben and Jerry’s. Shared with Alex.